THERE’S SOMETHING ABOUT GOING to the market that makes me feel like a global citizen, like I’ve done my good deed for the day and have directly supported my kinfolk. My grandparents were pig farmers, so my roots are in the fields, and I know full well the path from farm to table. 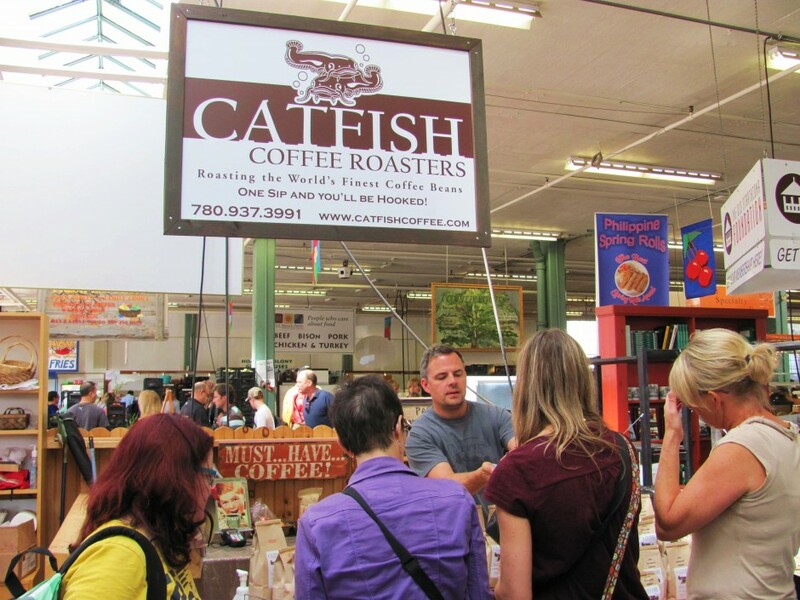 In Edmonton, Alberta, the place to find a taste of the farm is in a former Edmonton Transit bus barn, where over 130 vendors gather every Saturday for the Old Strathcona Farmers’ Market. Despite having had a heap of waffles at the hotel just an hour before, my sister Kiley is game to eat again. She’s good this way. Her childhood pickiness has fallen by the wayside and we often compare notes about the latest and greatest things we’ve eaten. Our last conversation was about our favourite summer market find — lavender and hibiscus popsicles. Would we find a new take on the gourmet popsicle trend in the Old Strathcona? Once inside the market, conversations with strangers unfold easily — about pie crust recipes, apple picking, and what vendor sells the best peach jam. Kiley notes the bundle of monster sunflowers a woman has in her hands, “Where did you get those beauties?” She wishes out loud that fresh flowers would survive her four-hour drive back home the following day, and the two of them talk sunflowers at the market entrance for five minutes. We join the crowd gathered around the red Massey Ferguson tractor hitched up to a makeshift farmhouse and learn that owner John Varty and his fiancée, Molly Daley, are actually driving the rig across Canada to raise awareness of our Canadian farmers. Varty, a prof at McMaster University in Hamilton, Ontario, has grand plans to spin their experience into a documentary series. Daley is a Florida native who grew up on mashed potatoes from a box. Now she’s compiling a nostalgic cookbook. Seeing the old Massey Ferguson tractor, I also feel nostalgic — for Sunday night dinners at my grandparents’ farm. We loved pillaging Nan’s garden, picking the zucchinis as big as baseball bats and eating tart raspberries until we had cramps. Master pickler Bea looks to be in her 70s, and at her booth I feel like I’m poking around my grandmother’s shelves of homemade jams, chutneys and beets. There’s a small seasonal window to find cucumbers suitable for the mustard pickle recipe (they must be of a certain size and nearly seedless). I only know of three people that make this Herculean preservation effort, and they all live in Prince Edward Island. Bea’s handwritten labels are in that sweet elderly cursive, and for $7 a jar I feel like I’m stealing. I can’t wait to do the official east-west mustard pickle taste test. Eager to buy more edible Edmonton souvenirs, Kiley and I queue up to dip pretzel sticks in the open mustard jars at Country Kitchen. We must try nearly half of the 50 varieties that cross mustard with unexpected combinations like orange espresso, champagne honey garlic, and merlot chocolate. I’m a sucker for the tequila lime, just like the owner, Patricia Smith. Kiley favours the mesquite mango. At Marina’s Cuisine, Marina Medvedev herself urges us to try a pelmeni (meat dumpling). It’s a savoury cross between a ravioli and a perogi, and it makes me wish our hotel room had a hot plate and fry pan. Stuffed with a variety of fillings, Marina’s soft and sweet blinchikis are like portable pancakes. My sister and I keep loose tabs on each other, reconvening wherever we find free samples, and there are plenty: briny beer cheese strings offered on toothpicks, candy-coated watermelon, sambuca almonds. At the Olive Me booth, Kiley is squirreling away olive samples. I join her and soon we’re both chipmunk-cheeked. We try the Full Monty (stuffed with almonds, feta, dill, and garlic) and the Great Mistake (almond, sundried tomato, garlic, and basil), the Five Alarms (jacked up with chili flakes), feta pesto, and the Hot Chili Lime. Deli containers of these go for $8 and would be a complete dinner with a bottle of wine. Though the market is predominantly fruit and vegetable vendors, several tables are rented by local artists like “trashcrafter” Jan Przysiezniak of Jelly Parrot Trash Crafts. 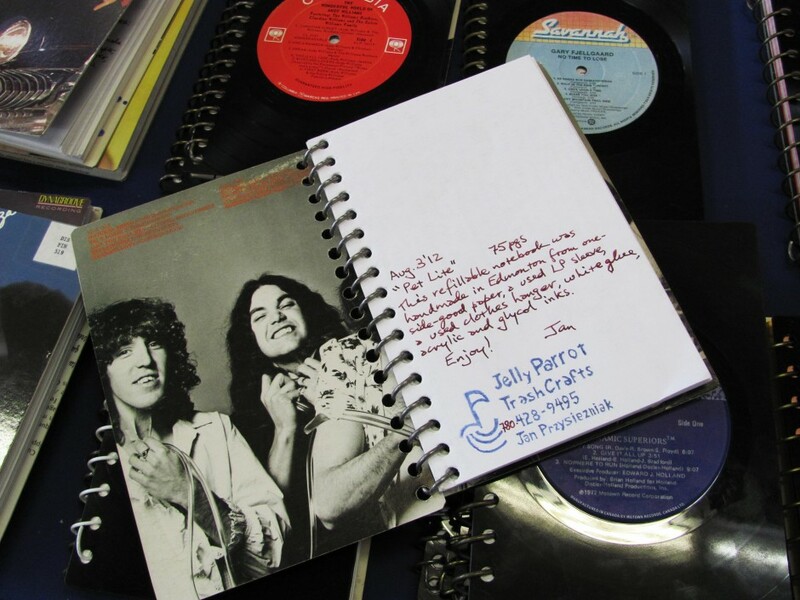 His work is 99% reclaimed or recycled materials, keeping in tune with his purpose to create “handmade goods in an environmentally respectful fashion, and to make a comfortably slow and healthy living at it.” His “upcycled” journals are a genius conversion of old LPs and album covers filled with recycled two-sided music sheets, bound together by re-used wire hanger spine coils. He converts some of the smaller vinyl scrap into coasters. Jan does exactly what he promises, “turning the discarded into the niftily useful.” Flipping through the album covers, I remember my own trashcrafting days: stealing my grandmother’s old nylons and wire hangers to create fishing nets to catch crayfish and minnows. Przysiezniak definitely capitalized on a more solid business plan with his upcycling. Before we hop on the High Level Bridge Streetcar (“the world’s highest streetcar river crossing”) to downtown, we stop in at Catfish Coffee Roasters to recalibrate. Dominic, the owner, is handsome and grinning, amiable and apparently in love with his coffee beans. I already know I want a half pound, for the name alone: Whisker Twister dark roast ($8), though the Black Cat Cuckoo Italian espresso and Brew Ha Ha are equally appealing. The small-batch roasting company adheres to very responsible standards by only offering what’s seasonally available and organic. A catalytic afterburner reduces roasting emissions to less than 10%. When I ask about where his beans can be purchased outside the market, Dominic emphasizes that he wants to retain his smallness, to keep the business as “non-work.” Instead of mass popularity and being readily available in chain stores, he wants the peaceful and relaxed farmer’s market atmosphere. For him, it’s all about the interaction and conversation, and sharing coffee love. He explains the process in making decaf beans (with steamed saltwater versus the standard acetone), how Indian monsoons pummel beans in that region and create an entirely different flavour profile. “Do you taste burlap and burnt grass in the light roast?” It’s all about the terroir (soil), we learn, as I get my beans ground for my French press. Like all the market vendors, Dominic loves what he does and sharing how he does it. We leave the market, loaded down with pickle jars, mustards, hemp bars, and coffee, feeling like we’ve made a genuine contribution to the local community. Two days later, back in Toronto, I make note of the Wednesday night market close to my neighbourhood. 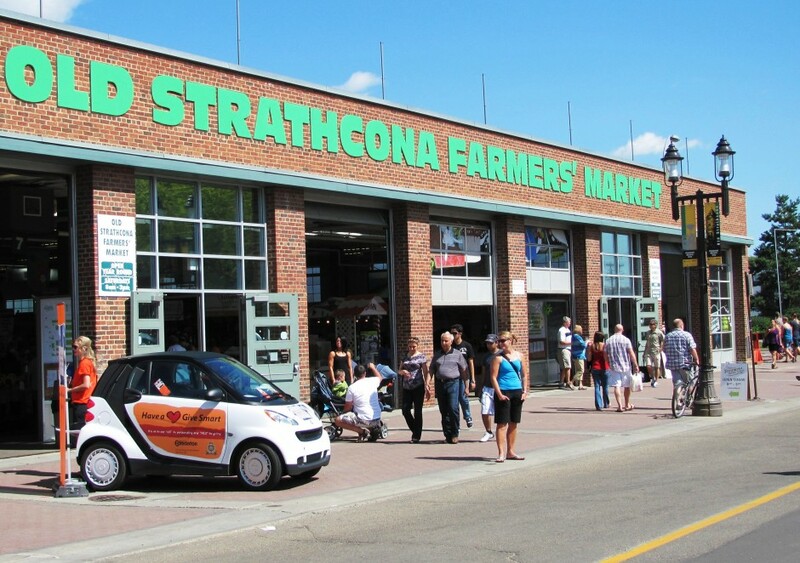 After talking with the Old Strathcona vendors, I want to hear the story behind the apples and honey I routinely buy. I want to learn about the generations that have tapped the sugar maples to make my syrup. I want to thank the farmer who has toiled to produce the beets and asparagus I fill my vegetable crisper with. Digging into Bea’s mustard pickles, I realize that despite living in the city, I can still connect with my roots and bring the farm into my home. Get there: The Old Strathcona Farmers’ Market is open 8-3pm Saturdays, year-round.